This month we have several reports on playing conditions covering the following: Sante Fe Station and Red Rock casinos in Las Vegas (by Stu D. Hoss); Reno casinos (by KC Brooks); St. Louis casinos (by JBP): and Foxwoods and Mohegan Sun casinos (by Joe "Freeload" Freda). If you want to learn about some advanced advantage plays for blackjack, check out the article by Mark Gruetze. Need a refresher on when to vary your bets and playing strategy when card counting? Check out Nicholas Colon's article. Paul Wilson penned an interesting article, actually an interview with a friend who plays video poker frugally (some nice frugal tips). Meanwhile, video poker pro Dunbar explains the effect of using a "wrong" strategy when playing video poker (more great tips). John Grochowski answers some interesting questions dealing with progressive jackpots on video blackjack games; lowering the jackpot for tax forms from $1200 to $600; apparent cheating at video poker; and the effect of reporting large wins on your income tax. Lastly, we have our roundup of upcoming blackjack tournaments courtesy of www.blackjacktournaments.com. There are two spots remaining for the Speed Count Blackjack Class that I will be teaching in Las Vegas on June 24th. To register, call me at 1-251-648-2471 ASAP. This article will test your skills as a card counter. Written by blackjack pro and BJI contributing writer JPB, the quiz appeared in BJI #136. It's not easy; give it a try. 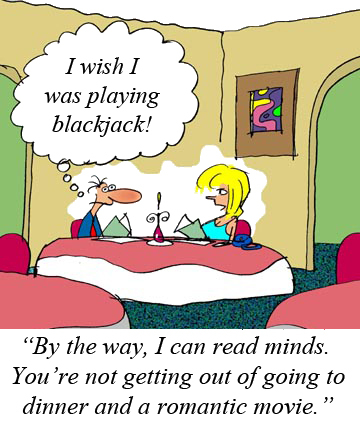 Ken Smith's Basic and Advanced Blackjack Strategy Cards are convenient, plastic-coated, pocket-sized and color-coded. They are ideal for use as an aid while you play. Strategy cards are discounted for BJI subscribers. Click here for details on the basic set of cards, and click here for the advanced set of cards. "For my play, Red Rock is a double-deck house thanks to playable rules and consistent deck penetration..."
"I love to visit Reno; and when I'm there, I exclusively play single -blackjack games at..."
"St. Louis has been an enjoyable place for me to play blackjack over the years. Since I only travel there every few months, at most, and usually play short sessions, I am able to avoid overexposure. Here are the current playing conditions..."
"After some time in Atlantic City, it was back to my home turf in New England with visits to Foxwoods and Mohegan Sun. The pair of southern Connecticut rivals are located 10 miles apart, with competition more fierce than ever for business from their regular patrons. Here's how it went on this trip..."
"Casinos have far more to fear from 'lucky idiots' than from the best card counters, says one of the country's top gambling mathematicians. The reason is because..."
"Part 3 covers the optimal betting strategy (i.e., how to vary your bet with the true count), and at what counts we vary from basic strategy to maximize profit..."
"This month I am going to continue the cash/comps theme by presenting a recent interview with a gambling acquaintance of mine that fights the good fight in this realm. His name is..."
"You don't know how to play DDB. You play JOB like a champ, though. You wonder, am I better off playing the 99.45% JOB game or should I play DDB with my JOB strategy and hope I still have more than the 99.45% return..."
"John Grochowski answers reader's question dealing with progressive jackpots on video blackjack games; lowering the jackpot for tax forms from $1200 to $600; apparent cheating at video poker; and more..."